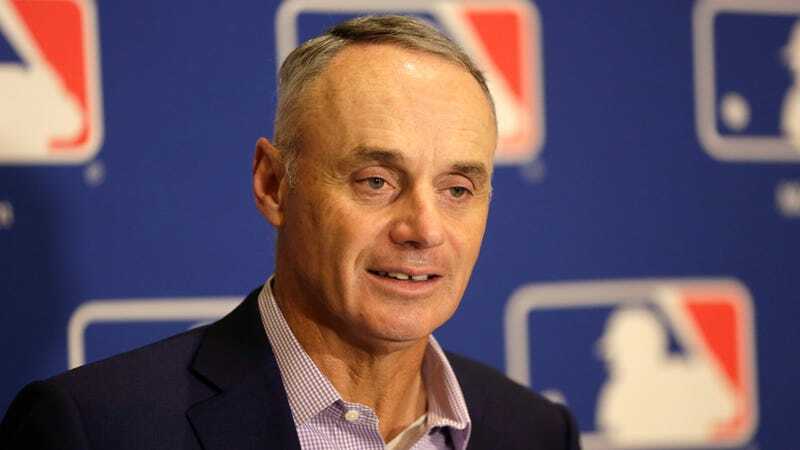 Major League Baseball is launching a “diversity fellowship program” aimed at creating roles specifically for women and people of color in front offices and in the Commissioner’s Office in New York. Still, a fellowship program is a newly aggressive move for the league, albeit one that will still only produce 23 specifically allotted jobs for “diverse” candidates. But with the program, MLB is attempting to make it as simple as possible for clubs to bring in new personnel from outside their existing (largely white) circles. · Open exclusively to people of color and female candidates. · Candidates must be recent graduates (no more than 24 months post-graduation) with either a Bachelor’s degree, Master’s Degrees or related advanced degree. · For those candidates interested in the Club Fellowship Program, a commitment of at least 18 months of employment is required at any participating Club in which you are placed. · Exact locations are up to the discretion of Major League Baseball and participating Clubs. · For those candidates interested in the Office of the Commissioner Fellowship Program, you must commit to at least three years of employment located in New York City. It will be a rotational, three-year phase opportunity to: (1) two years in Baseball Operations , focusing on International Operations & Scouting, Umpiring and On-field Rules & Regulations; and (2) one year working within the League Economics Department. I spoke with Renée Tirado, MLB’s VP of Talent Acquisition, Diversity & Inclusion, about the program and the landscape of career opportunities in sports amongst different demographics. She said there are 20 clubs participating in the program, and the clubs, not the league, are responsible for the full-time salaries and benefits. The widening competition in the job market is a problem for baseball regardless of class, gender, or race. The sport has come to require advanced, specialized skills to work in operations and analytics, and these skills are increasingly unspecific to baseball. Despite MLB being a big-money operation, salaries are still pretty depressed, and there can be a lot more money to be made by going to work in Silicon Valley or investment banks or anywhere generational wealth is made. Baseball’s continued reliance on underpaid internships and entry-level gigs weeds out some of the talent with the highest potential, and I suppose this fellowship program, depending on the precise salaries and how they correlate to the costs of living in the markets they’ll be placed, is meant to keep someone’s foot in the door instead of quickly losing them to Google. But the question always posed when MLB trots out a diversity initiative is, simply: Why? A lot of fans seem to believe that creating distinct opportunities for people of color and women goes against the concept of finding the best people for the job. It’s an unexamined view that ignores systems of privilege and pipelines, and networking and connections, and who has the resources, status, and opportunities to simply get connected in the first place with the people in positions of hiring authority. A disparity in access and social positioning doesn’t mean those left out are less qualified or less bright or less capable than those who have connections and privilege in their favor. It also doesn’t mean that the best people for the jobs are currently being passed up, but rather that there can be many different “right” people for jobs, and hiring managers are not always prone to looking outside their pre-existing networks. MLB is trying to expand those networks. A wider pool of candidates with a wider range of thought is better for business. The league hopes the clubs can save themselves from PR blunders like pandering “Ladies’ Nights”; it hopes to better determine how to celebrate the diversity in the past and present of the sport. It’s just good business. Major League Baseball can make more money, and keep making money, and find new ways to make money, and engage different types of fans to give them more money. Baseball remains a traditional sport rooted in American whiteness—and now, on the field, value-suppressed international labor—in a country that despite its fractures, is inevitably becoming more diverse and modern. What I’m interested in learning is the eventual demographic breakdown of MLB’s “diversity fellows.” Who is represented, and how they fit into the mosaic of the growing and changing nature of the game. In the grand scheme of things, 23 jobs in an industry of 30 clubs and a big central league office with a thriving multimedia offshoot is just a light finger on the scale. But it’s something, and it’s deliberate, and diversity usually doesn’t happen by accident.